Last Sunday, I held the small piece of bread in my left hand, and the tiny plastic glass of ‘wine’ in my right. 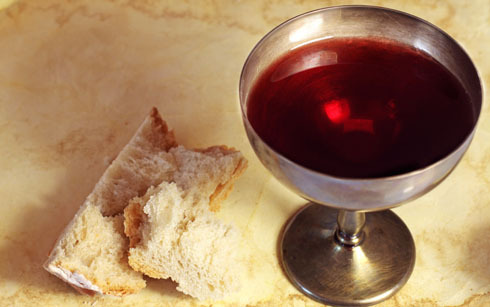 The pastor recited a prayer, and with my eyes closed, I recalled the last time I’d taken communion. It was at Linda’s funeral, in a Catholic church. No, I’m not Catholic, but I am a rebel. Therefore I’ll be damned if anyone will tell me whether or not I can partake of the body and blood of my Lord Jesus Christ. I grinned at the memory while I chewed and drank. I had to stay seated during communion because my newly mended right ankle was achy and stiff. The pastor spoke of finding joy in our nearness to God. That happiness is fleeting, but joy is everlasting. As the lesson continued, I began to do my daily ankle exercises. I pointed my right toes as far forward as I could and held them there for ten seconds. I released the stretch and pulled my toes up toward the sky as far as I could. I held the stretch for another ten seconds, repeating each stretch 15 times. Then came the side to side stretches. The sermon progressed and I placed my right foot back on the floor. It didn’t ache nearly as much as it did before I stretched the Achilles tendon six ways from Sunday. A particular bible verse struck a raw emotional nerve and I began to cry. Don’t ask me what it was about, because I can’t recall it. All I know is it had something to do with paying for indiscretions and mistakes. That once we are forgiven by God, we must learn to forgive ourselves. As I wiped my eyes, Laura asked if I was all right, and I assured her I was. That I was better than all right. That I was forgiven. After the sermon ended, we made our way to the back of the church. My ankle was stiff as I began to walk, but I noticed that I no longer had any pain. The familiar ache had disappeared! A smile spread across my face and was lit by the morning sun. I walked with almost an entirely normal gait. I felt free for the first time since March 11, 2014. I. Was. Free! It’s Wednesday night and the pain has not returned. I’ve had a few twinges here and there, but that’s because I had a very intense physical therapy session on Tuesday afternoon. On March 12, 2014 after 5.5 hours or reconstructive surgery on my right ankle, my life changed. I know it will never be the same, but I am assured with God’s grace and love I have recovered.